In this rare firsthand account, Lorna Rhodes takes us into a hidden world that lies at the heart of the maximum security prison. Focusing on the "supermaximums"—and the mental health units that complement them—Rhodes conveys the internal contradictions of a system mandated to both punish and treat. Her often harrowing, sometimes poignant, exploration of maximum security confinement includes vivid testimony from prisoners and prison workers, describes routines and practices inside prison walls, and takes a hard look at the prison industry. More than an exposé, Total Confinement is a theoretically sophisticated meditation on what incarceration tells us about who we are as a society. 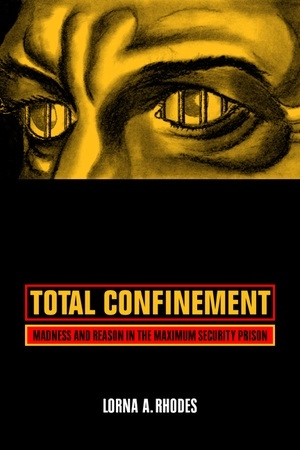 Rhodes tackles difficult questions about the extreme conditions of confinement, the treatment of the mentally ill in prisons, and an ever-advancing technology of isolation and surveillance. Using her superb interview skills and powers of observation, she documents how prisoners, workers, and administrators all struggle to retain dignity and a sense of self within maximum security institutions. In settings that place in question the very humanity of those who live and work in them, Rhodes discovers complex interactions—from the violent to the tender—among prisoners and staff. Total Confinement offers an indispensable close-up of the implications of our dependence on prisons to solve long-standing problems of crime and injustice in the United States. Lorna A. Rhodes, Professor of Anthropology at the University of Washington, is author of Emptying Beds: The Work of an Emergency Psychiatric Unit (California, 1991).